an analysis of the Flindell's Western Luminary subscribers list of 1815. List 2. Subscribers in alphabetical order with identifications. Surnames: A-B, C-D, E-G, H-L, M-Q, R-S, T-Y. NOTE: This is a revised version of a paper originally presented in 1994 at the annual symposium of the Centre for South Western Historical Studies at the University of Exeter. 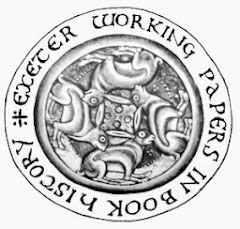 On 8 March 1813 a new newspaper appeared in Exeter to compete with Trewman's Exeter Flying Post and Woolmer's Exeter and Plymouth Gazette. The two existing newspapers were both four-page broadsheets with five columns to the page and closely set text. The mastheads were modest affairs, typical of the provincial press of the time. The newcomer was a cast in a different mould. It was of a much smaller format with eight pages in each issue instead of four, printed on the largest sheet of paper allowed by the Stamp Office , and had only three columns to the page as opposed to five, generously separated by double rules. It had a wood engraving for its masthead depicting an eagle with the motto "Semper fidelis" and a decorative engraved rule at the foot of the first page. It is perhaps no coincidence that among the advertisements on the front page of the first issue was one for Caslon's printing types. Its title confirmed that it set out to appeal to a broad range of readers: Flindell's Western Luminary: the Family Newspaper of the Nobility and Gentry, Farmers & Traders of the counties of Devon, Cornwall, Dorset & Somerset.. In a prospectus Thomas Flindell had set out his aims in starting this new publication - an attempt also to justify its high price of 8d an issue as opposed to 6½d. His plan to "promote the solid interests and rational pleasures of the various classes which happily compose our English fabric of social order" lead him to devote at least one page "solely to the interests of Agriculture, Mining, Trade, and Domestic Economy", "another page shall be devoted to te drawing room and the fireside; - to Fashion, Literature, and the Arts." This section, soon to be entitled the 'Literary and Fashionable Repository' was given prominence by being set in a larger type. "The next feature ... is a comprehensive detail of the various occurrences of its own district". Coverage of international affairs would benefit from "facilities for obtaining original intelligence, by the two great naval rendezvous of Torbay and Plymouth, and the important packet station of Falmouth. The editorial function "the summing up" was also seen as important by Flindell. Entitled the 'Review', it provided an opportunity for the editor to make utterances on matters of the day, often in outspoken terms. Flindell concluded his prospectus with testimonials to answer the question that would doubtless be asked: "Who is this man, that would introduce his newspaper into my Family?" In the first issue he seeks further to reassure his readers by declaring his "fixed determination not to admit into his columns any of those filthy advertisements, which would indeed ill become a family newspaper". He had also learned that "he cannot publish his paper on Monday mornings, without a serious infringement on the Sabbath. He has, therefore, resolved that Tuesday morning, instead of Monday (as first announced) shall be his settled time of publishing." Perhaps it was more than a happy coincidence that Tuesday was the only day when a London newspaper did not arrive in Exeter . The newspaper's pages were numbered sequentially and it may be that Flindell intended to produce an index. None has been traced and sequential numbering was dropped after the first volume. Similar experiments with new forms of newspaper were being undertaken elsewhere in the country at this period, for example the Liverpool Mercury, established in 1811 by Egerton Smith, which was provided with a title-page and index to each annual volume . Thomas Flindell brought to Exeter a wide experience of work in printing offices across the country. He had been born in Helston, probably in 1767, and apprenticed in Falmouth, probably to Philip Elliott. It may have been Elliott's death in 1787 which set Flindell on his years of travel. This period took him to Bath, Edinburgh, London and Doncaster, where in 1790 he became editor of the Doncaster Gazette. In 1798 he returned to Helston to found the Stannary Press where he began the publication of the Bible in fortnightly parts. In 1800 he moved to Falmouth where, on 7 March 1801 he founded the Cornwall Gazette and Falmouth Packet, the first newspaper in Cornwall. His partners in this undertaking failed in business and Flindell himself was imprisoned for debt in Bodmin gaol, the last issue of the paper appearing on 16 October 1802. At that time a subscription was raised among Cornish landowners to start a weekly newspaper. Flindell offered his services as printer and on 2 July 1803 in Truro he launched the first issue of the Royal Cornwall Gazette. It was vigorously conducted but fell into the hands of the Tory party, a factor which lead to the launching in 1810 of the Whig West Briton. Two years warfare with the rival editor resulted in the sale of the newspaper to Nettletons and Flindell's move to Exeter to establish a newspaper on his own principles . Flindell also brought with him to Exeter the continuing worry of a Chancery lawsuit against his former partners in the Cornwall gazette . It was clearly in Flindell's interest to cultivate his readership and to make them feel part of a wider community, a community with shared ideals and common loyalties - including, of course, loyalty to himself and to his newspaper. 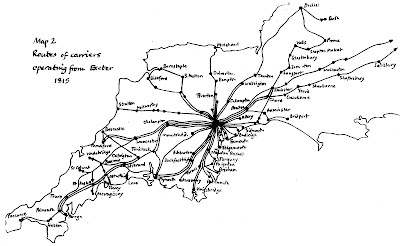 A complex network of distribution had been set up, the outlines of which were laid down in the prospectus: "Such of the inhabitants of Exeter as are disposed to receive it, are requested to give their orders to the person appointed to wait on them for that purpose; or leave their address at the printing-office as soon as convenient. Other persons within the four counties (if not personally waited on by the Traveller for the Luminary) will have the goodness to give their orders through some reputable bookseller or news-agent in their nearest post town. All persons wishing to have it sent to them beyond the boundaries of Devon, Cornwall, Dorset and Somerset, must send their orders through some respectable inhabitant of Exeter who will at the same time undertake for the payment, quarterly" . Flindell made efforts to involve subscribers in the paper. In the first issue Flindell offered to "lay open his paper to any and every writer, whose object it may be to promote useful knowledge, or rational amusements" . A question and answer section was introduced and of course Flindell was reliant on subscribers for local intelligence. According to Flindell it was at the request of "some very respectable Subscribers" that he was induced during 1814 to commence a most unusual undertaking for a newspaper, the publication of a complete list of subscribers . Such an undertaking was not entirely without precedent; on 14 and 21 June 1776 a list of 2,230 subscribers to the York Chronicle has appeared in that newspaper , but the task facing Flindell was was easier said than done for reasons stated by the publisher, which incidentally demonstrate the extent to which the newspaper penetrated communities throughout the region. Perhaps two thirds of the impression was estimated to go into the hands of small groups of from two to six persons or families who clubbed together to meet the costs of subscribing. "In some cases", said Flindell, "a single copy serves a whole village or little country parish." In such cases only the name of the person who paid the subscription could be included on the list. Copies of newspapers were often forwarded by residents of larger towns to friends in more remote areas or to gentlemen on country estates at a distance from the nearest post town. Also some of the agents who received weekly parcels of papers wholesale did not send the names of the individuals for which they had ordered. Nevertheless the resulting list, which appeared in 1815, indicates that the printer and many of the readers regarded the Western Luminary as something different from an ordinary newspaper. The list includes 1695 names including eight multiple subscribers to 33 copies, bringing the total number of copies accounted for to 1720. Details given are sparse and, as Flindell admits, "some are perhaps mis-spelt or improperly designated". However duplication appears to be rare and many names can be more closely identified from other sources, permitting a degree of analysis. Not all identifications in the lists which follow are definite but a considerable amount of information can be read into the lists, providing a unique insight into the community of readers assembled by Flindell. An attempt at an analysis by occupation and class is given in table 1. The multiple subscribers are in all cases printers or booksellers except for Tarring, postmaster at Brixham who subscribed for three copies. The others are Bligh of Bodmin (3 copies), Boyce of Tiverton (6), Haydon & Co. of Plymouth (2), Hoxland and Co of Plymouth Dock (3), Salter of Tiverton (4), Syle of Barnstaple (8) and Salter of Dartmouth (4). These printers were doubtless acting as agents but there are in all at least 54 members of the book trades and libraries represented, the majority subscribing to single copies, perhaps for their own information, or to make them available to their customers - this must certainly have been true of the seven libraries mentioned. Other places where newspapers were made publicly available were inns and taverns and a total of 83 innkeepers or publicans have been identified as well as five hotels. Other subscribers are known to have run assembly rooms (5), coffee houses (5) or similar institutions, for example J.Stockford who ran the public rooms in Teignmouth. The clergy are well represented with 155 (9.1%) bearing the title of Reverend. Only about half of these have so far been identified as vicars (26) or rectors (56). The armed services can be identified by a total of 94 officers, 65 in the army, including three officers' messes. Other professionals to be found include 47 attornies, 21 bankers, 32 surgeons, 5 physicans and 23 schoolmasters. Commerce is represented by some 60 to 70 merchants, including dealers in wine, spirits, textiles and timber. There are 13 MPs, nine lords and three ladies. Many of the gentry can be identified thanks to the lists of country seats provided in the Cornwall and Devon volumes of the Lysons brothers' Magna Britannia . Of the 148 country seats listed for Cornwall 41 are represented among the subscribers (28% of the total) and slightly better than Devon where 94 subscribers can be found for the 351 seats listed (26% of the total). The 135 gentry thus identified account for 8.0% of the total number of 1695 subscribers. Table 1 only notes 83 gentry because many are classed under other headings. Doubtless many unidentified names would also fall into the category of gentry. There are a total of 150 women (8.8% of the total) made up of 99 Mrs, 48 Misses and 3 Ladies. Flindell's successful penetration of the establishment can also be demonstrated by the fact that of 30 sheriffs of Devon between 1801 and 1830 twelve appear in the subscription list. The figure for Cornwall is eleven. The political allegiance of some of the Exeter subscribers can be ascertained by an analysis of the 1818 poll book. In that election 939 individuals polled of which 61 can be identified as subscribers to the Western Luminary . In all 293 votes were cast for Northmore. Robert Newton described Thomas Northmore of Cleeve as "the only genuine radical who stood for Exeter in the 19th century" . The table below indicates that a much higher proportion of Flindell's subscribers rejected the radical candidate and supported the party of Church and State. They were also slightly more inclined to be plumpers and not to split their vote. The arrangement of the list is also revealing. It is alphabetical as far as the first letter only. Nobility and MPs are listed first under each letter, then others in apparently random order although persons from the same locality tend to be grouped together. Closer examination however reveals that each letter is presented in the same geographical order and it is possible to identify six or seven distribution routes for the newspaper (see table 2 and map 1), which were used to gather details of subscribers who were then probably entered into a ledger with one or more pages allocated to each letter. Under most letters there is a briefer second round to gather up stragglers. In the largest letter, B, there are sections considerably out of order, as if Flindell had run out of space and had to use another section of the ledger. The first route that can be identified starts in Penzance and pursues a tortuous itinerary across Cornwall, zigzagging from coast to coast via Redruth, Helston, Falmouth, Padstow, Fowey, Saltash, Stratton and then direct from Launceston via Okehampton to Exeter. These meanderings do not necessarily reflect the actual route of the traveller for Cornwall, which would probably have been more direct, leaving parcels to be collected by more local distributors. A second route leaves Exeter via Crediton, North Tawton, Hatherleigh and Holsworthy, doubling back to take in Torrington, Bideford and Barnstaple, possibly going on to South Molton. Ilfracombe may have been served by this traveller or by another via Tiverton. 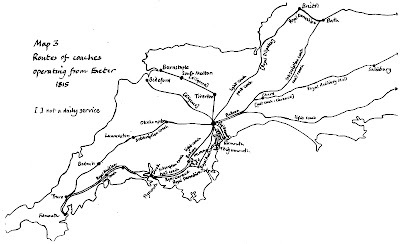 The route from Plymouth may well have proceeded via Tavistock and across the Moor to Ashburton where it may have picked up subscribers' names for Modbury, Kingsbridge, Dartmouth and Totnes. The route from Brixham and Torbay, apparently served from Newton Abbot, is unclear and may be different from the coastal route from Teignmouth, Dawlish and Starcross. The east coast is served by a route through Topsham, Lympstone, Exmouth, probaby continuing to Ottery, Honiton and Axminster. This route may also have served the Dorset towns, although an independent carrier is more likely for these, and also for the subscribers in Somerset, Bath, Bristol, Oxford and London. Closer analysis may clarify these routes, as may comparison with the routes of contemporary carriers (see map 2) and coach services (see map 3) . While trades are only rarely given, the place of residence can be ascertained in all but a very few cases, permitting precise identification of the catchment area and an estimate of market penetration. Of the 1695 subscribers, only 264 (15.6%) are Exeter residents. In all 1160 (68.4%) are Devon residents and 391 (23.1%) Cornish. Although Flindell claims in his subtitle that his paper serves Devon, Cornwall Dorset and Somerset, Dorset with 15 subscribers and Somerset with 27 only account for 2.5% of the total subscribers. London has 36 subscribers and Oxford 15, mainly members of the University, five of them at Exeter College. 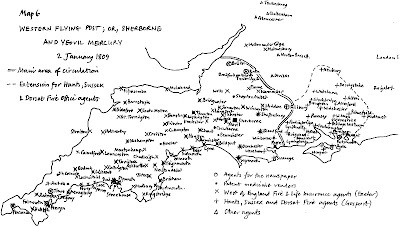 Outside Exeter the town with the largest number of subscribers is Plymouth with 57 (if the three towns are taken together) but this is closely followed by Falmouth with 47 subscribers and Truro with 45, a tribute to the loyalty of those who had supported his early newspaper ventures in those towns. Barnstaple equals Truro with 45, then comes Teignmouth with 43, then there is a considerable gap before we reach Dawlish and Bideford, each with 31, Exmouth with 30 and Penzance and Tavistock, each with 28. A fuller analysis is in table 3. At least as important as mere numbers is the question of market penetration (see map 4 and table 3). It is difficult to be precise on this, but the figures that follow are based on the 1811 census, divided by 4.64 to arrive at the number of households. The analysis by towns should be treated with some caution. Where addresses can be more closely identified (for example from contemporary subscription lists for other publications) they are frequently at some distance from the town itself, the nearest postal town being given as the address. Registration districts have been adopted as the means of grouping wider areas. Although these were not introduced until the 1830s, they provide a more useful basis for analysis than the hundred. Thus, applying the 264 Exeter subscribers to the 22558 inhabitants of Exeter we arrive at a figure of 5.4% or one household in 19. Exeter, though, is not at the top of the table. Other towns which exceed it are Newton Abbot (6.6%) Teignmouth (6.9%) Kingsbridge (7.1%) Truro (8.4%) and Dawlish (10.1%). Analysis of registration districts reveals none approaching Exeter's 5.4%. Only the adjacent districts of St Thomas (2.5%) and Newton Abbot (2.6%) exceed the 2% level. Falmouth with 1.9% comes next, then Barnstaple with 1.7%. Only Honiton, Tavistock, Plymouth, Saint Columb and Truro exceed 1.0% and outside Devon and Cornwall no towns or areas exceed 0.5% except perhaps Oxford. It should be noted though that these figures represent a minimum. Bearing in mind Flindell's statement that the majority of copies are subscribed for by groups of from two to six persons and the fact that others go into libraries, coffee houses and inns, the figures could be at least doubled. The catchment area therefore covers all of Devon and Cornwall with a definite thinning out round the Plymouth area, which had two newspapers of its own, but holding up well in the Truro area, despite the presence there of two newspapers. The adjoining districts of Redruth and Helston are poorly covered, as are the districts of Camelford, Stratton and Holsworthy on the Cornwall/Devon border. Most striking is the abrupt thinning out of coverage at the eastern border of Devon, a thinning out which creeps into the Axminster district of east Devon. Comparison can be made with other newspapers . While we do not have the detailed subscription information which is available for the Western Luminary, lists of distributors, the names of local agents cited in advertisements for national products such as patent medicines, insurance companies and lotteries, and the addresses of regional advertisers can provide an approximate indication of the newspaper's catchment area. 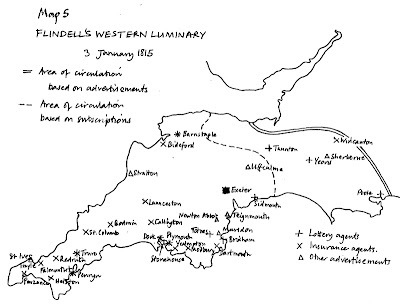 Applying this test to the issue of Flindell's Western Luminary for 3 January 1815 and comparing it with the subscription list shows how this is not always a precise indicator (see map 5). Flindell's avoidance of patent medicine advertisements and the absence of a list of distributors for the newspaper removes two good indicators of circulation areas and the relatively few advertisements suggest better coverage of Somerset and Dorset than is revealed by the subscription list. Other newspapers parallel the pattern of Flindell's paper and show that, like the tail of a comet, which points away from the sun, the catchment area, while centred on the place of publication, spreads further on the opposite side to the metropolis. This effect must be taken into account when attempting to define boundaries for many kinds of regional cultural or economic communities. The circulation of The Western Flying Post; or, Sherborne and Yeovil Mercury of 1809  has this feature, the circulation area extending only 20 miles eastward of Sherborne but 150 miles westward to Penzance (see map 6). The extension into Hampshire is probably exaggerated by the presence of an advertisement of the Gosport based insurance company the Hants, Sussex and Dorset Fire Office. 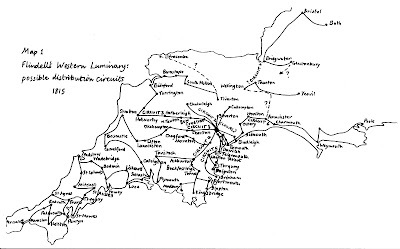 The Taunton Courier in 1824  extends its coverage westward through north Devon and southward to the Dorset coast (see map 7). The eastward limit is affected by the presence of the large towns of Bath and Bristol where there are agents although the level of circulation would have been much lower than for the papers actually printed in those towns. 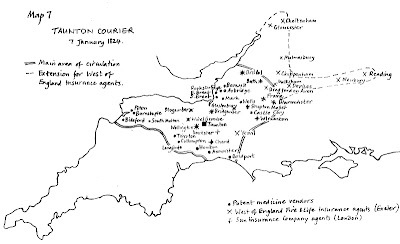 The advertisement for the Exeter based West of England Fire and Life Insurance Office includes no Devon agents but, compared with the patent medicine agents, thir coverage extends much further to the north and east than the probable main circulation area of the Taunton Courier. 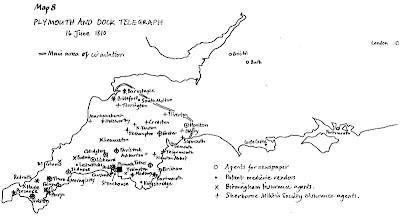 The Plymouth and Dock Telegraph circulation area in 1810  does not display this tailing away from the metropolis, but extends well into Devon as well as Cornwall, perhaps because the naval and foreign intelligence from a port close to the western approaches was sometimes in advance of the news available from London (see map 8). One way in which Flindell attempted to capitalise on and mould his community of readers can be examined by looking at lists of subscribers to other publications. In 1815 he proposed to publish the works of Francis Gregor of Trewarthennick, a former M.P. From October to December 1815 he ran a vigorous advertising campaign eliciting subscriptions. Most weeks carried a lengthy advertisement for the publication, the first on 3 October, listing three persons who had set the ball rolling by subscribing to 45 copies. By 17 October this had grown to 15 patrons subscribing to about 80 copies. Each week new subscribers were listed to encourage others to join the ranks. By the end of the year 200 subscribers had been enlisted. When Flindell published the volume in 1816  272 subscribers are listed, 94 of whom also appear in the subscription list for the Western Luminary. On 17 January Flindell advertised a new periodical The Devonshire Adventurer. This was published in Tavistock and, although Flindell is not named on the title-page, of the 136 subscribers listed in the first issue , 36 also appear in the subscription list for Flindell's paper. Finally the subscription list for the revised edition of John Prince's Danmonii orientales illustres better known by its subtitle as "The worthies of Devon", which was published in Plymouth in 1810 , before Flindell's Western Luminary was established, and which sought out a national as well as a local market, contains no less than 78 subscribers to the newspaper among its 486 names. Clearly Flindell was cultivating and attracting an existing intellectual elite who were in the habit of subscribing to or purchasing relatively expensive publications. Even the magnificent series of etchings of the river Dart published by F.C.Lewis as late as 1821  included twenty of Flindell's subscribers of 1815 among the 163 copies that were subscribed for nation-wide. These additional subscriptions, except for Lewis's, are indicated in list 1. Whether Flindell managed to maintain his circulation in 1815 of around 1,700 copies is uncertain; correspondence with the London wholesale stationers Tipper and Fry in 1816 indicates that his monthly supply of stamped sheets of paper varied between 4,000 and 5,000, suggesting a circulation of around 1,000  - although he may have obtained supplies of stamped paper from more than one source. Nevertheless a good indicator of a sense of community is the presence of a common interest which its members are prepared to support in a tangible manner. In 1821 the opportunity arose for Flindell's community of readers to demonstrate that they possessed this feature. Flindell's outspokenness, to which he had admitted in his prospectus for the Western Luminary landed him in trouble on several occasions, but the most serious resulted from intemperate language on the subject of Queen Caroline of whom he wrote in the issue of 11 July 1820: "Shall a woman who is as notoriously devoted to Bacchus as to Venus - shall such a woman as would, if found on our pavement, be committed to bridewell and whipped, be held up in the light of suffering innocence?" Although he had acknowledged the illegality and imprudence of his libel and declared his sorrow for it, on 19 March 1821 he was found guilty of a libel on the Queen and sentenced to eight months imprisonment in Exeter gaol. Under the direction of Alderman Phillips a committee was established to "manage a subscription to relieve Mr. Findell from the pressure occasioned by the loss and expence incurred by him in his trial." This was done without alerting Flindell to their intentions out of a "sense of his long and valuable services in the cause of Church and State" and the first advertisement appeared not in Flindell's paper but in Trewman's Exeter Flying Post . Within little more than a week more than sixty people raised about £160 and names of subscribers were listed in issues of the Western Luminary in June and July. These contain a total of over 170 individuals subscribing a total of £418/19/6. Some were anonymous, such as The Man in the Moon, others reveal the political affiliations of the subscribers, for example Confusion to the Radicals or A King's Man or A True Patriot, and perhaps 40 are also to be found in the subscription list of six years before. These include Mrs Gregor, late of Trewarthennick, the widow of the M.P. whose works Flindell had published in 1816, Sir William Templer Pole of Shute House, Admiral Schank of Dawlish and the Rev. Dr. Fisher, Sub-Dean of Exeter. The money raised was a considerable sum. At that time a craftsman in the building trades in Exeter could expect to earn 21/- (£1.05) for a full week's work , so the total raised at 1996 prices could be in the region of £100,000. However communities of interest based around an individual are shifting and ephemeral. Flindell's health had been badly affected by his imprisonment and he died on 11 July 1824 . The Western Luminary passed into the hands of the Dewdney family, who were still conducting it in the 1850s. Within a few years though the newspaper world of Exeter was to be transformed following the arrival in January 1827 of Thomas Latimer, the radical journalist . 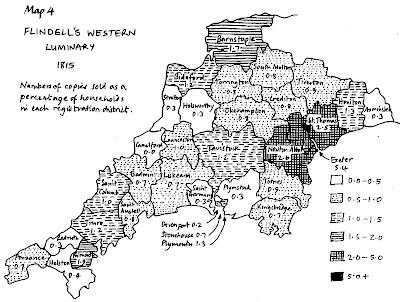 New alignments were to be drawn up which would shift the intellectual communities of Devon dramatically from their positions when Flindell arrived in Exeter in 1813, little more than ten years previously. 1. Thomas Flindell, Flindell's western luminary: prospectus (Exeter: T.Flindell, 1813), col. 1. The first volume of the newspaper is described, perhaps from the publisher's own copy in: Cecil Holman, 'Flindell's western luminary and family newspaper', Devon and Cornwall notes & queries, vol. 28 (1960), 269-70. 3. Michael Perkin, 'Egerton Smith and the early nineteenth century book trade in Liverpool', in Spreading the word: the distribution networks of print (Winchester: St. Pauls Bibliographies 1990), p.151-164. 4. For short biographies of Flindell see: R.A.J.Potts, 'Early Cornish Printers, 1740-1850', Journal of the Royal Institution of Cornwall, new ser., vol. 4, (1963), p.307-9. C.H.Timperley, Encyclopedia of literary and typographical anecdote, (London: Henry G.Bohn, 1842), p.893. Ashley Rowe, 'Thomas Flindell, Cornwall's pioneer journalist', Devon and Cornwall notes & queries, vol. 28 (1960? ), p.266-269. 5. DRO 48/26/13. This small collection of correspondence is transcribed at the end of this volume. The records of the Chancery lawsuit certainly deserve further investigation. 6. Flindell's western luminary: list of subscribers, (Exeter: T.Flindell, ), p.1. 7. P.J.Wallis, 'Cross-regional connexions', in Six centuries of the provincial book trade in Britain, edited by Peter Isaac (Winchester: St Paul's Bibliographies, 1990), p.92. 9. The addresses, speeches, squibs, songs, &c. which were circulated during the recent general election (Exeter: R.Cullum, 1818), p.130. 10. Robert Newton. Eighteenth century Exeter (Exeter: University of Exeter, 1984), p.155. 11. Exeter pocket journal for 1816 (Exeter: R.Trewman, ), p.53-57. 12. A useful study of newspaper distribution, based on the records of the Hampshire chronicle and the Salisbury journal is: C.Y.Ferdinand, 'Local distribution networks in 18th-century England', in Spreading the word: the distribution networks of print (Winchester: St. Pauls Bibliographies, 1990), p131-149. 13. Western flying post; or, Sherborne & Yeovil mercury, vol. 60, no. 3126 (2 Jan 1809). 14. Taunton courier, 7 Jan 1824. 15. Plymouth and Dock telegraph, 16 June 1810. 16. Francis Gregor, The works of Francis Gregor, of Trewarthennick, Esq, (Exeter: Printed by T.Flindell, 1816). Advertisements and lengthening lists of subscribers had appeared in Flindell's western luminary e.g. 3 Oct 1815 p.5 (3 patrons, 45 copies), 24 Oct p. 5 (32 patrons, 127 copies), 14 Nov p. 3 (ca.112 patrons, ca.291 copies). 17. The Devonshire adventurer, conducted by The Rev. George John Freeman, L.L.B. No. 1. August 26, 1814 (Tavistock: Printed by James Chave, ). 18. John Prince, Danmonii orientales illustres; or, the worthies of Devon, 2nd ed. (Plymouth: Rees & Curtis, 1810). 19. Frederic Christian Lewis, The scenery of the River Dart (London: F.C.Lewis, 1821). 21. Robert Newton. Eighteenth century Exeter (Exeter: University of Exeter, 1984), p.115, 133. 22. An excellent study of this radical journalist is to be found in: Richard S.Lambert, The Cobbett of the west: a study of Thomas Latimer and the struggle between press and pulpit at Exeter (London: Nicholson & Watson, 1939).